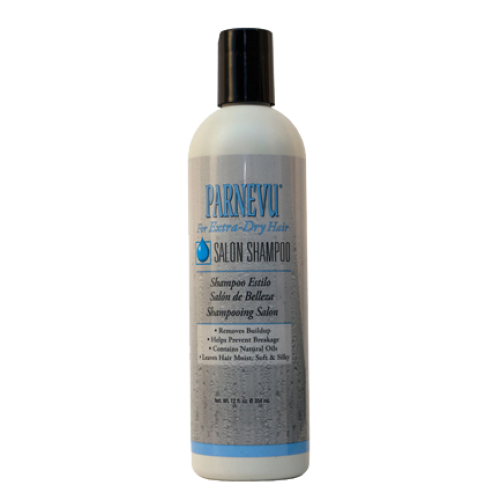 PARNEVU Extra Dry Salon Shampoo is pH-balanced and specially formulated to cleanse your hair and scalp of oil buildup without stripping. The unique formula uses gentle cleansing agents derived from coconut oils and palm nuts to effectively remove grease from the hair and scalp. Natural moisturizers penetrate the hair to replace and lock in vital moisture lost due to chemical damage and everyday styling, leaving hair soft and manageable. Directions for Use: Wet hair thoroughly. Apply shampoo to scalp, hairline, and ends of hair. Massage the scalp with fingertips, working shampoo into hair. Rinse thoroughly and repeat. For best results, follow with PARNEVU Extra Dry After Shampoo Conditioner. Size: 12 fl. oz. / 354 ml. INGREDIENTS: Water (Aqua, Eau), Ammonium Lauryl Sulfate, Ammonium Laureth Sulfate, Lauramide DEA, Lauryl Glucoside, Cocamide DEA, Glycol Distearate, Sodium Laureth Sulfate, Cocamide MEA, Laureth-10, Acrylates Copolymer, Sodium Cocoyl Alaninate, Sodium PCA, Sodium Lactate, Arginine Aspartic Acid, PCA, Glycine Alanine, Serine, Valine, Proline, Threinine, Isoleucine, Histidine, Phenylalanine, Hydrolyzed Collagen, Propylene Glycol, Fragrance (Parfum), Disodium EDTA, Guar Hydroxypropyltrimonium Chloride. Citric Acid, Ammonium Hydroxide, Ammonium Chloride, Sodium Hydroxide, Methylchloroisothiazolinone, Methylisothiazolinone, Red 4 (CI 14700).